This morning I had the chance to check out a brand new series of installations opening at the Hirshhorn Museum November 1st. The three pieces by Rafael Lozano-Hemmer exploring the relationship of Biometric Technology routinely associated with privacy invasion to us in a more comfortable context. The pieces all beg the user to scan their fingerprints and take their pulse. The scans and heartbeats then become a part of the exhibition. The wall takes on the unique ridges and loops of all their users. The second room is filled with three tanks of water. 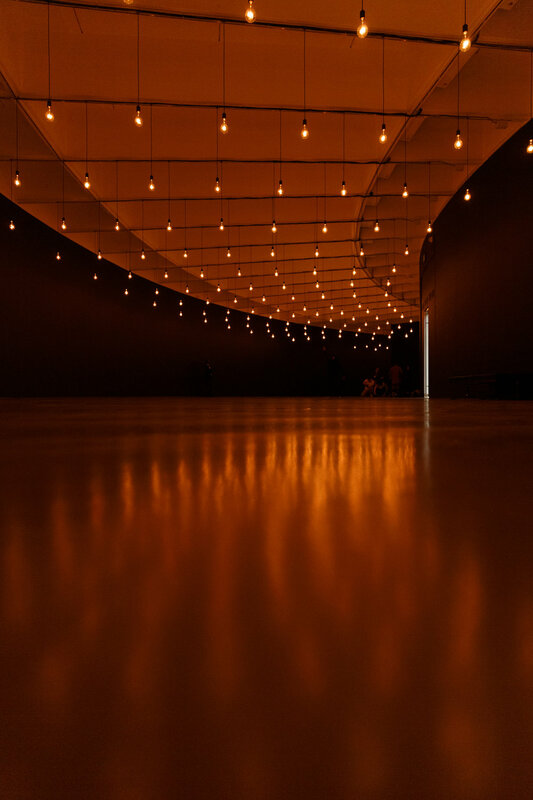 Each tank has multiple input points where users pulses are captured and transferred into the water where the light shining on the surface reflects the motion up and onto the wall. The interaction of the different inputs and waves with the shadows of the others moving along the gallery. The final piece is the most impressive. In a dark room filled with incandescent bulbs that pulse with the heartbeat of the person at the pedestal, all the other users are left marveling at the peaceful space. When no one is connected, each of the previous pulses is shown in one of the bulbs. Opening November 1st, the installation is sure to be a hit with everyone who visits. Be sure to head to the museum to check it out.